The Monterey Bay area grows leafy greens, artichokes, cauliflower, Brussels sprouts and strawberries, among other produce. Editor's Note: This series takes a close-up look at the SBA's economic "clusters" designed to aid regional businesses. Read installments on Minnesota and the Carolinas. In Silicon Valley, entrepreneurs grow countless iPhone apps. A few miles to the south, in the Monterey Bay, Calif., area, the harvest is just as plentiful, if a bit more nutritious: Large farmers grow huge quantities of leafy greens and berries. Sprouting from those fields is the Project 17 Agricultural Technology cluster, which aims to bring both sides together -- the small tech entrepreneurs and the region's big farms -- to keep the agriculture industry thriving. Project 17 is part of a two-year-old Small Business Administrationpilot program designed to spark innovation and get small businesses growing again. The region's $8 billion agriculture industry, which produces in excess of 80 percent of the nation's fresh greens every year, is ripe for innovation, says Susan Barich, the cluster's director. Large growers like Dole, Driscoll’s, Monterey Mushrooms and Chiquita, which have farms in the area, have been forced to sell produce at lower prices over the past decade, putting a squeeze on profits, she said. As a result, more growers are looking to tech entrepreneurs to come up with ways to make the industry more efficient. In a sense, "we are helping to create an industry," she says. Project 17, which has received $1.2 million worth of funding from the SBA over the past 2 years, is perfectly situated to bridge the agriculture and technology gap. The Monterey Bay region is a short drive away from Silicon Valley, and home to a smattering of heavyweight research institutions, including the University of California at Davis’s agricultural research programs. The cluster is named for a trifecta of local "17s," including nearby Highway 17, its 17th Congressional District, and a scenic 17-mile route through Carmel and the Pacific Grove. In its first year, the Project 17 cluster provided more than 5,000 hours of business mentoring to small businesses in workshops and one-on-one consulting. It also produced a business-plan competition with 62 small-business participants; created two “think tank sessions” where small agriculture-technology businesses met with the large agricultural businesses in their market; and helped four small businesses sell technologies to companies in their industry. In its first year (second year data is still being tallied), Project 17 reported that it helped small businesses in the region and industry gain access to nearly $48 million of capital, create 285 new jobs, and retain 114 jobs. For example, Chris Malençon, the founder and CEO of Spyglass BioSecurity, a Marina, Calif., water management and research company, says his connection with Project 17 helped him understand the specific water needs of the agriculture industry. He says he's also used Project 17 to network with “key stakeholders” in the industry, according to the cluster's annual report. Jack and Catherine Goldwasser, the owners of Watch Technologies, an agricultural-water technology company that designs, manufactures and installs water-canal gates, also credit Project 17's connections with growing their business, according to the report. They're expecting a projected profit of $300,000 in 2012 after being nonprofitable just a couple of years earlier. Watch Technologies has hired 4 new employees and Jack Goldwasser says he has had to work 18 to 20 hour days to keep up with growing demand. July 5, 2012 -- Negotiations continue among various ag interests including the Agriculture Coalition for Immigration Reform (ACIR) and the American Farm Bureau in an effort to develop a unified position. A conceptual outline was discussed that would establish a single worker program framework that would have a portable visa option where workers could move at will among registered employers and a contract option where a worker would enter to work under one or a series of contracts. There seems to be an increasing sense of pressure to move that process along swiftly, especially as labor shortages are being experienced in many areas. Our sense is that many common elements are under discussion. We'll report further developments as they materialize. Additionally we've had a few news cycles since President Obama's announcement that it would defer deportation and provide work-authorization for otherwise law-abiding but undocumented young people who were brought to the U.S. under the age of 16 and meet certain other criteria. Most has been predictable, with most, but not all, reform advocates heralding the announcement, and restrictionists using a certain seven-letter word beginning with "A". It still remains to be seen whether the move undercuts any possible efforts to push narrow immigration reforms this year, as some are claiming. On June 26 the State Water Board issued a letter noting that they'd received stay requests on the Ag Waiver (Conditional Waiver of Waste Discharge Requirements Order No. R3-2012-0011) and are now providing an opportunity for interested persons to submit written responses to the requests for stay by 12:00 noon on Friday, July 13, 2012. Growers who are experiencing current or expect to experience harm over the coming six to twelve months if this stay request weren't accepted are encouraged to write letters. GSA has been advised that this letter and process have now bypassed the 30-day letter for the stay (note this does not affect the 30-day letter for the appeal request) by the State Water Board. Theoretically, in August the State Board could notice and hold a hearing regarding whether to issue a stay, meaning that a stay could potentially be in effect by September 1. Please contact Abby Taylor-Silva at 831-422-8844 with questions. Growers have until August 1st, 2012 to notify CCRWQCB of their selection to 'opt-in' to a cooperative groundwater monitoring program. While Grower-Shipper Association of Central California, Monterey County Farm Bureau, and Santa Clara County Farm Bureau have expressed interest in developing such a program, there are no specifics that can be shared at this time; a meeting to begin defining the program's element is scheduled for July 9th. Submission of proposals for all cooperative groundwater monitoring programs are due in March 2013, so there are many months yet to prepare the proposal. While costs are a consideration, all organizations involved are committed to keeping costs to participating growers as low as possible. A number of funding sources are being evaluated to defray the costs of start-up and possibly the initial year of monitoring. At this time you may 'opt-in' to the concept of cooperative groundwater monitoring. This option allows farmers to defer their reporting of groundwater monitoring until the cooperative monitoring program is submitted and accepted in early to mid-2013. If the proposal is not accepted by CCRWQCB, or if the proposal is not submitted due to infeasibility, there is no penalty to those grower who selected this option; the groundwater monitoring requirement will begin with individual sampling in October 2013 and March 2014, with first results reportable in October 2014. If growers choose to participate in cooperative groundwater monitoring, they are urged to make their selection on their eNOI form during the month of July (deadline is August 1st). There is no commitment by growers at this time to a specific program or funding mechanism. Growers can 'opt-in' by logging on to their eNOI document and changing the 'checking box' from individual groundwater monitoring to cooperative groundwater monitoring. Growers wanting to participate in the first planning meeting for a cooperative groundwater monitoring program are encouraged to attend on Monday, July 9th at 10am at the Grower-Shipper Association office in Salinas (512 Pajaro St.). Crop value in Monterey County last year dipped below $4 billion for the first time since 2008, mostly due to weather and commodity prices. Despite the slight drop to $3.85 billion, it's still the third highest crop value the county has ever seen — and in a year that included a cool, rainy spring. County Agricultural Commissioner Eric Lauritzen released the 2011 crop report Tuesday, highlighting the diversity of agricultural production, with 10 crops bringing in more than $100 million apiece and 16 others pulling in more than $10 million. That diversity is different from most other farming counties in California, and since the state is a national powerhouse in agriculture, that's saying something, Lauritzen said. In terms of agriculture, he said, "We can speak about this being one of the most important counties in the nation." Industry leaders attending the unveiling of the state-mandated annual crop report echoed Lauritzen's praise for the strength and adaptability of Monterey County agriculture — from farmers to packers and producers to harvest crews. "I think it's rather remarkable that the agricultural community was able to achieve what they did in spite of the weather," said Norm Groot, executive director of the Monterey County Farm Bureau. Groot and other leaders struck a self-congratulatory tone coupled with a subtle warning to policymakers and consumers to lay off agriculture when it comes to regulations, or risk killing Monterey County's golden goose. "While local and state and national economies are tanking, agriculture here continues to hold its own," said Jim Bogart, president of the Grower-Shipper Association of Central California. "To me, that is a reflection of the resourcefulness, the resiliency, the innovation, the cutting-edge technologies that this industry here in the Central Coast continues to lead the world in." Bogart urged legislators and regulators to consider that Monterey County agriculture contributes $8.2 billion to the local economy, according to a recent economic study funded by the agricultural commissioner's office that didn't take into account economic and other costs of agriculture. Farm labor availability, immigration reform, food safety, water quality, land use and crop protection are all hot issues for his members, Bogart said. "Do we as a community want to jeopardize this precious resource, this remarkable industry that means so much to so many here, and really throughout the nation in the world?" he said. "I don't think that we do." In 2011, leaf lettuce overtook strawberries as the county's top crop, with a value of $777 million, a 7 percent increase, compared with $714 million for strawberries, which dropped 5 percent in value. The 4 percent decline in total crop values can be attributed to the global economy, fuel prices, increased costs associated with food safety practices and other costs that are out of the control of individual growers, Lauritzen said. Wine grape growers suffered one of the biggest losses in crop value, losing 18 percent in crop value over 2010. Due to lower yields, the production value of chardonnay, the "work horse" of Monterey grapes, was down 23 percent to $46 million. Riesling, meanwhile, jumped 14 percent on a stronger average price per ton. Despite the drop in total wine grape value, Rhonda Motil of Monterey County Vintners and Growers Association gave a rosier projection for 2012. "The good news that we couldn't say over the last couple of years is that the average price per ton is on the rise," she said. more pounds of commodities. Canada imported the lion's share — 67 percent — of this produce. · The value of cattle and calf production was up 25 percent to $39 million. Kate Moser can be reached at 646-4487 or kmoser@montereyherald.com. Follow her on Twitter @Kate_Moser. By Dan Charles -- We'd probably like to think that clean, safe food goes hand in hand with pristine nature, with lots of wildlife and clean water. But in the part of California that grows a lot of the country's lettuce and spinach, these two goals have come into conflict. Environmental advocates say a single-minded focus on food safety has forced growers of salad greens to strip vegetation from around their fields, harming wildlife and polluting streams and rivers. The heart of this conflict is the Salinas Valley, on California's central coast. And my guide to the valley, on this beautiful spring day, is Daniel Mountjoy, an ecologist with a nonprofit organization called Sustainable Conservation. "I just love the drive down through here," Mountjoy says, as we head southeast from Castroville, the self-proclaimed "Artichoke Center of the World." We can see mountains to the east and the west, but the valley itself, miles wide, is as flat as high-tech field-leveling machines could make it. The Salinas River meanders down the middle of the valley, visible as a thicket of trees. But most of what we see, though, is mile after mile of fields. Some are bare, ready for planting, others with rows of green leaves just emerging from brown dirt. This is one of the country's biggest sources of fresh lettuce and spinach. It's often called America's salad bowl. And for the past 40 years, this valley has been the scene of a struggle to find a balance between some of the most intensive farming in the world and what's left of nature. More and listen to the story here . . .
On April 15 and August 19, 2011, several of the world’s largest producers of fresh herbs, vegetables and berries met for two think-tank sessions at Hartnell College’s Alisal Campus in Salinas to discuss one of the most abundant elements on the planet and one of the most vital to agriculture – water – how to clean it up, keep it clean and reduce its use in their production of 85% of the world’s fresh vegetables and berries. The group was convened by Grower-Shipper Association in partnership with Hartnell and Project 17, funded by the U.S. Small Business Administration to dovetail technology solutions into the agriculture industry to help Ag increase their bottom-line profitability. So the questions for the group were, 1) what are the problems with the Salinas Valley’s agricultural water and 2) what are some technologies that can provide solutions to those problems? The first question was tackled in the April session and the second in August. 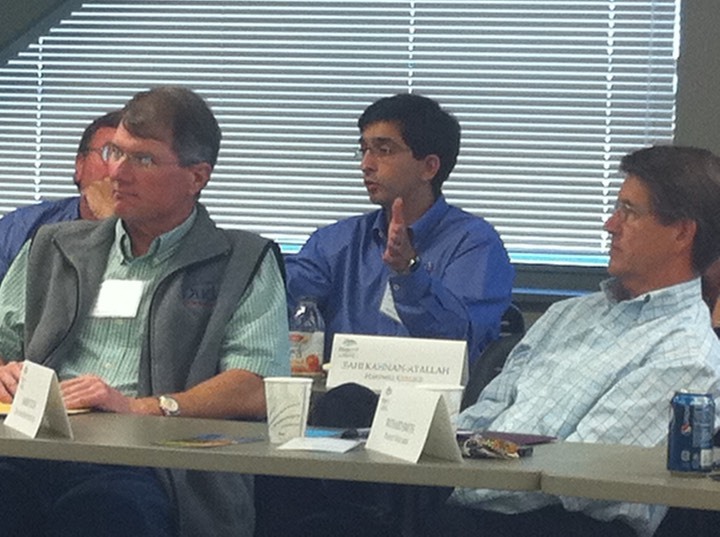 Sammy Duda of Duda Farms, Dr. Zahi Kanaan-Atallah of Hartnell's Alisal Campus, and Richard Smith of Paraiso Vineyards discuss technology options for cleaning up nitrates in regional ag water. Participating Ag companies included Tanimura & Antle, Rose Royal Radicchio, Duda Farm Fresh Foods, Taylor Farms, Fresh Express/Chiquita, Dole, Ocean Mist, Driscoll’s, Rio Farms, Gills Onions, Luis Scattini & Sons and Paraiso Vineyards. Representatives from business looking to assist Ag with solutions included Wilbur-Ellis Company, Muller Irrigation of Salinas Valley, AMEC Geomatrix, John Deere Water, APTwater, Watch Technologies, ANZU Technology, BioVantage Resources, Wise Solutions and SAP Global Business Incubator. Also present were representatives from the Western Growers Association, Monterey County Water Resources Agency, UC Davis, Grower-Shipper Association, Cal State University at Monterey Bay, and Hartnell College. 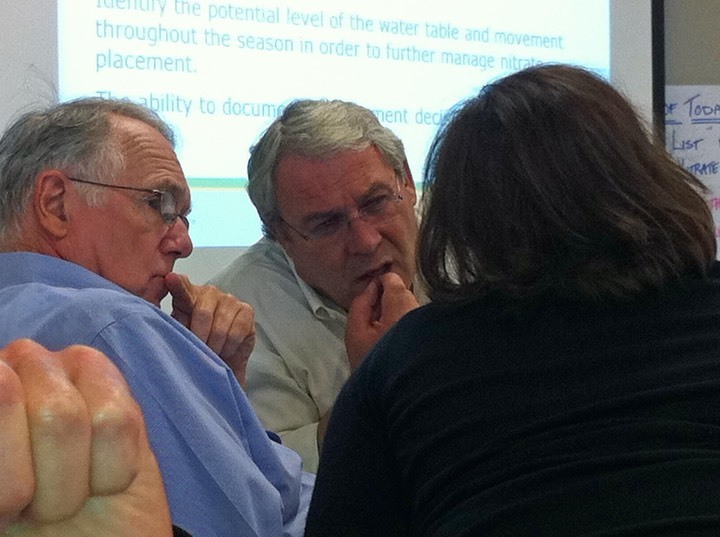 Terry Applebury of APT Water, Salinas Mayor Dennis Donohue and Abby Taylor-Silva of the Central Coast Grower-Shipper Association confer on nitrate management strategies. After defining the problems in the April session, the group created a “wish list” of solutions, especially to nitrate issues, but also discussed problems of storm-water run-off, water supply and quality, sea-water intrusion, recycled water, crop-water distribution uniformity, keeping nutrients in root zones and monitoring for optimal water usage. In the August session, Dr. Tim Hartz from UC Davis and Dr. Marc Los Huertos of CSUMB discussed bio-de-nitrification of regional surface and ground water through an anaerobic process that mimics the water clean-up work that natural wetlands perform. UC Davis' Dr. Tim Hartz describe bio-de-nitrification processes. Murray Einarson, principle hydrologist of AMEC Geomatrix, based in Oakland, presented case studies where forcing water through bio-de-nitrification systems of wood chips and sugars had cleaned surface and ground water entering water ways. Growers were encouraged to learn that they might not only be able to reduce pollution of surface water from agricultural nitrates, but might also be able to use these techniques to clean up ground-water that was polluted by farms a hundred years ago. Craig Hornung of John Deere Water then led a discussion of how growers can reduce water use by implementing technology that can tell them when the root zones of crops and trees are saturated, eliminating waste of water. 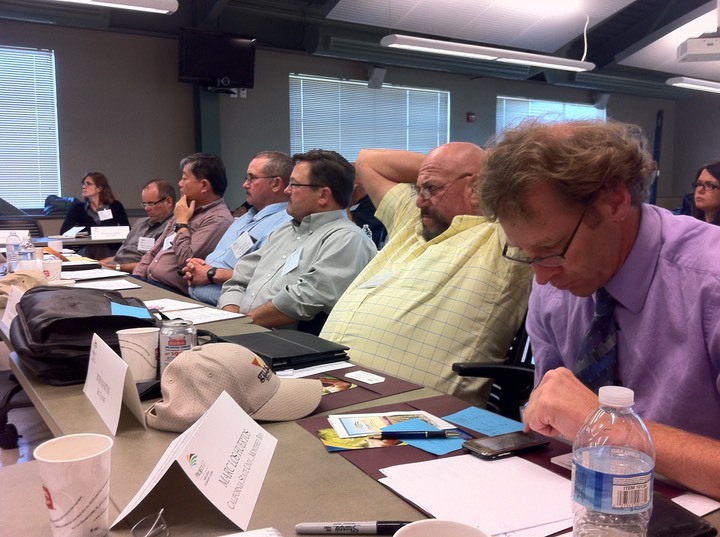 Participants were pro-active in looking for solutions to the region’s ag-water issues. But a one size solution will not fit all. The thorny issues ahead will be to identify and implement a suite of solutions that work for different soil types and different water sources across the region. Stay tuned. Marina, Calif., July 29, 2011 -- SBA Region IX Administrator Elizabeth Echols visited Marina Friday, July 29, 2011, for a briefing on the progress of the nine major initiatives of Project 17, an SBA-funded regional innovation cluster (RIC) and a tour of the city's business incubator, the Marina Technology Cluster. After 10 months of funding, and in partnership with regional governments, associations, businesses and educational institutions, Project 17 has begun work on the creation of an inventory of regional assets and resources to identify the strengths of the region as well as provide knowledge of business-supply-chain availability in the region; an Ag-Tech Association to serve as a gathering place for ag-technology, a forum for knowledge exchange and business education, a group for setting technical standards for the deployment of technology, a forum for marketing to the agricultural industry, and a forum for exposing patents to businesses for technology transfer & commercialization; an Ag-Tech Fund to provide seed investment for ag-tech companies; a think-tank capability to convene various industry players to discuss and seek solutions to industry problems and noodle out new markets for the ag-tech industry; at least one technology research park to provide space for companies performing federal research to dual commercialize technology and promote technology transfer; the Monterey Bay Regional Business Plan Competition to connect start-ups with regional business-development resources, create and invigorate the regional entrepreneurial community and promote regional start-up and entrepreneurship support programs; coalitions for grant applications to bring capital to the region; a robotics initiative to advance robotics research for agriculture; and a vender Trials Committee to help vet new technologies for agriculture. Barich Business Services of Santa Cruz was awarded the SBA contract in September, 2010, to create a regional cluster of technology companies that can bring technological solutions to the wicked and thorny issues of the agricultural industry and help grower-shippers to increase their shrinking bottom-line revenues. In addition to these initiatives, Project 17 has partnered with the Agricultural Landbased Association (ALBA), Everyone's Harvest of Marina, and Lightfoot Industries of Santa Cruz to provide workshops and training for underrepresented communities in the region to improve their ability to grow, market and prepare healthy food. Project 17 has also supported workshops by the Monterey Bay International Trade Association to assist agricultural and ag-tech businesses in the region with export readiness. It has also partnered with NextSpace in Santa Cruz to provide the community with information on "The Future of Food." Appointed by President Barack Obama, Ms. Echols oversees SBA’s programs, services, and 120 employees throughout Region IX, which encompasses California, Nevada, Arizona, Hawaii, Guam and the U.S territories in the Pacific. SBA plays a leading role helping small business owners and entrepreneurs secure financing, technical assistance, training, and federal contracts. As part of SBA’s economic recovery efforts, Region IX has backed more than 11,000 Recovery Act loans worth nearly $6 billion. Ms. Echols has distinguished herself as a strong advocate for innovation, sustainability, economic development, and job creation. Most recently, Ms. Echols served as Director of the Northern California chapter of the U.S. Green Building Council, where she focused on developing public policy and forging alliances to support green jobs. She also served as a member of the Obama-Biden Transition Team co-leading the agency review process for the National Telecommunications and Information Administration. Previously, Ms. Echols served as Director of Policy at Google, where she managed the development and implementation of global e-commerce and content policies for over 40 Google consumer and business products. Ms. Echols is passionate about providing opportunities to the youth and underserved markets. She served as CEO of OpNet Community Ventures, a nationally recognized non-profit that prepared low-income young adults for good jobs in the technology industry and helped them start their own multi-media businesses. During the Clinton Administration, Ms. Echols played a leading role at the White House and the Department of Commerce. She served as the White House’s first Executive Director of the Electronic Commerce Working Group under Vice President Al Gore where she was at the forefront of developing and implementing the Administration’s strategy on global Internet and e-commerce issues. She also served as Senior Advisor to Commerce Secretary Daley advising him on domestic and international Internet and telecommunications issues. Ms. Echols has been recognized as a “Mover and Shaker” by Business Week, and received the Gold Medal Award, the highest honor presented by the U.S. Secretary of Commerce. She has been profiled in numerous publications, including The New York Times, Wired Magazine, The National Journal, and Working Women Magazine. Ms. Echols received her BA degree with honors in Economics and Political Science from Yale University. She earned her JD from Stanford Law School and served as an editor on the Stanford Law Review. Salinas, Calif., December 2, 2010 -- The company that won a contract to bring agricultural technology to the Monterey Bay area is forming an association of companies that are here now. The group is called the Agricultural Technology Association, said Susan Barich on Wednesday. She made the announcement at the third annual Green Trade Network Summit in Salinas, an event sponsored by the Monterey Bay International Trade Association. Barich, whose company, Barich Business Services, operates the Marina Technology Cluster, won a one-year $600,000 Small Business Administration contract in September to help develop agriculture-related technology. That contract can be renewed for a second year. The effort was dubbed Project 17, for the 17th Congressional District, Highway 17 and 17 Mile Drive. It covers Santa Cruz, Monterey and San Benito counties. Barich said she found the possibilities greater than she realized when she got the contract. "I went fishing for salmon and caught a whale," she joked to the audience of 50 people at the Fox Theater. The technology association can be helpful in leveraging the resources of the region, Barich said. The association has the support of the Grower-Shipper Association of Central California and Rep. Sam Farr, D-Carmel. There is a range of possibilities for government funding that Project 17 can help with, Barich said. Some money available is for studies at universities and colleges; some of the schools require cooperation with a private company. Barich said she envisions the Monterey Bay area becoming a place where agricultural technology companies come if they want to be at the forefront of the industry, just as other technology companies go Silicon Valley. Before submitting the Small Business Administration application for Project 17, Barich said, she contacted people in the area and found support for concentrating the application on agriculture, especially from people outside the industry. Santa Cruz, Calif. November 15, 2010 -- TradePort.org, the Monterey Bay International Trade Association (MBITA) and GlobalCalifornia.com today announced that Marina Technology Cluster (MTC) and Project 17 Director Susan Barich will be the lunchtime keynote speaker at the third annual Green Trade Network Summit -- Agriculture and the Green Revolution -- (http://www.mbita.org/greentradenetwork/summit2010.html) -- on December 1 at the Fox Theatre in Salinas. Barich's company, Barich Business Services (www.BarichBiz.com), which operates the MTC under contract to the City of Marina, has been awarded a contract with the Small Business Administration (SBA) to support the growth of an advanced-agricultural-technology industry in the tri-county region of the Monterey Bay Area that will help producers increase profits. "MBITA and Project 17 have partnered to help entrepreneurs commercialize and bring to market technological solutions to the pressing needs of growers and shippers regionally, nationally and internationally," said Barich. "Emerging companies like Watch Technologies with smart 'splitgates' for irrigation, ACSII-Inc. with enterprise software for the entire agriculture business and RTI with agronomy that draws nitrogen out of the air and fixes it in the soil, bring money-saving, productivity tools to the many agricultural enterprises. Environmental and business goals dovetail when reducing the use of chemicals and of water drives dollars to the producer's bottom line." The conference will facilitate interaction and information exchange among research scientists, agro-technology providers, trade promotion service providers, agronomic consultants, educators and public sector agencies, all addressing the 'greening' of agriculture, one of American's top industries. Panelists will address how we can create U.S. jobs by exporting these products, services and technologies to the global marketplace. Representatives from the SBA, Export-Import Bank and the U.S. Department of Commerce (USDOC) will discuss how to finance green technology exports and where the best global markets now exist for American green technologies, services and technologies for the agriculture industry. "The Greening of Agriculture is the new way of looking at agriculture and humanity," said presenter William Butler of GTIT-Green Innovational Technologies who has offices in Wuxi, China. "By thinking green technology and philosophy then we can fine tune agriculture to gain much more then what we have now, 1+1=3." "It's only appropriate that the agriculture sector should benefit from 'green' technologies," stated Robert Guthrie who will present the export loan guarantee program and credit insurance programs that the U.S. EximBank provides U.S. exporters of green technology, services and products. "Ex-Im Bank is prepared to finance the export of such environmentally friendly products and services at very attractive rates." By Jondi Gumz Santa Cruz Sentinel, Calif.
Sept. 22--SANTA CRUZ -- A pair of Santa Cruz-based small business advocates has won a $600,000 federal contract to champion companies that develop technology solutions for the Monterey Bay area's $10 billion agriculture industry. The one-year contract includes an option for a second year. Karen Mills, who heads the U.S. Small Business Administration, announced Monday that Barich Business Services is one of the 10 winners in the agency's "Innovative Economies" initiative to create jobs. More than 170 groups nationwide applied. Barich Business Services, based on Grey Seal Road in Live Oak, consists of Susan Barich, who has run the business incubator at the Marina Technology Center for eight years, and her husband Alan, a business turnaround and startup specialist. "We're pretty happy," said Barich, who named the proposal "Project 17" for Highway 17, the 17th Congressional District and 17-Mile Drive in Pebble Beach. "We're the perfect region for this convergence of agriculture and high-tech." She envisions entrepreneurs developing solutions for growers and creating jobs. Some 200 technology companies are located in Santa Cruz County alone, according to Tony Livoti of the Monterey Bay International Trade Association, one of 30 partners supporting the Barich proposal. One example of the challenges she cited: Walmart, the largest retailer of produce in the world, expected all its suppliers use radio frequency identification tags to track inventory but the designated frequency would not work well for vegetables with high water content. Other partners endorsing the proposal include Jim Bogart, president of the Grower Shipper Association of Central California; Jeremy Neuner of NextSpace in Santa Cruz; Patrick Reilly, a Santa Cruz-based intellectual property attorney; Ben Lomond consultant Susan Duggan; Capitola marketing specialist Denise Ryan; and Teresa Thomae of the Small Business Development Center in Aptos. When Rep. Sam Farr, D-Carmel, spoke at the Marina Technology Center three weeks ago, he predicted that research into food and health would be "huge." The U.S. Food and Drug Administration is expected to issue new produce safety regulations, perhaps as soon as October, in response to a deadly outbreak of bacterial contamination traced to spinach. "Growers are trying to beat government to the regulatory table," said Barich, who contends the investment in technology will not only track produce but also pay off in higher profits. Case in point: Antonio Sabarez developed enterprise software tat integrates a geographic information system with a Global Positioning System to monitor what's happening in the fields. He has two clients in Oxnard, one growing strawberries, the other leafy greens. Sabarez's company, ACSII, is one of five ag technology companies getting a start at the Marina Technology Center. Santa Cruz, Calif., September 20, 2010 -- Barich Business Services (BBS) today announced that it has been awarded a one-year contract of $600,000 with an option for a second year from the Small Business Administration's (SBA) Innovative Economies initiative to provide business mentoring, commercialization, market development and other start-up services to businesses within the Monterey, Santa Cruz and San Benito tri-county area's agricultural industry cluster. This pilot program from SBA aims to grow small businesses, create jobs and strengthen America's competitiveness by supporting the development of small businesses and the jobs they provide around an existing regional industry cluster. BBS's effort, dubbed "Project 17" for Highway 17, Congressional District 17 and the 17 Mile Drive, will support the region's $10 billion annual agricultural industry by assisting with the development of companies that bring technology solutions to solve increasing demands on the ag industry. BBS's response to the SBA's request for proposal was one of 10 selected from 173 responses submitted by economic development groups nation wide. BBS contracts with the City of Marina to operate the Marina Technology Cluster, the region's first technology incubator, and also produces the Monterey Bay Regional Business Plan Competition (www.mbrcompetion.com). "The confluence of agriculture and technology happens here," said BBS Partner Susan Barich of Santa Cruz. "Our proximity to Silicon Valley, combined with the technology research from institutions like the Naval Postgraduate School and UCSC, and an intelligent, educable workforce from south of our boarders make this the perfect project for the Monterey Bay Area." Thirty regional small-business service providers, cities, colleges, counties and universities joined Project 17 with letters of support and memoranda of understanding. WASHIINGTON - SBA Administrator Karen Mills announced today the U.S. Small Business Administration's support for 10 regional economic development and job creation efforts through a new pilot program, "Innovative Economies." The pilot program supports small businesses participation in regional economic "clusters" - collaborations between small businesses, the public sector, economic development and other organizations. "Maximizing a region's economic assets is one of the best ways to create long term job growth, and that's what SBA's new Innovative Economies pilot initiative is doing," Mills said. "Today we are announcing funding support for 10 regional economic clusters. SBA's support will help expand the opportunities and the role small businesses play in these regional collaborations, which are enhancing the ability to create jobs locally and compete on a national and global scale." The 10 "Innovative Economies" awardees selected from among 173 applicants to participate in the pilot program represent a wide range of diverse geographic areas and industries. From urban to rural and clean energy to robotics, the applicants focused on leading research and commercializing new products. SBA's funding will be provided to each cluster's organizing entity to strengthen opportunities for small businesses within the cluster. The funds can be used to provide services, including mentoring and counseling small businesses, as well as to attract more small business participation. SBA is supporting two types of innovative economies: Regional Innovation Clusters and Advanced Defense Technologies. The seven Regional Innovation Clusters focus on providing business training, commercialization and technology transfer services, counseling, mentoring and other services that support the growth and development of small businesses in the cluster region. The SBA also worked with the U.S. Department of Defense to identify areas around the country where regional innovation clusters can help meet critical defense technology needs. Three Advanced Defense Technology awardees will focus on providing business training, counseling, mentoring, matchmaking and other services to small businesses that focus on critical DoD technologies. Agriculture Innovation Cluster (Monterey - Santa Cruz - San Benito, Calif.) The AIC focus is on agricultural innovation, including production, related physical and human capital infrastructure, and leading-edge agriculture research. Carolinas' Nuclear Cluster (N.C., S.C.) The Carolinas' Nuclear Cluster provides strategy, structure, and on-the-ground execution to grow the North and South Carolina businesses that serve the nuclear energy industry locally, regionally, and multi-nationally. NorTech (Ohio) NorTech focuses on technology-based economic development in 21 counties of Northeast Ohio. Funds will help small business development within NorTech's FlexMatters initiative, which focuses on advanced energy and flexible electronics. Flexible electronics, which are electronic devices printed on flexible substrates, are emerging as a newly commercializable science, and a growing manufacturing opportunity. Von Braun Center for Science and Innovation (Huntsville, Ala.) VCSI's primary focus is Aero-Space technology with applications for NASA, DoD, and NOAA. Its projects have included robotics for the detection of Improvised Explosive Devices, supporting spacecraft launches and building new micro satellites.